Gallon grew up in Pereira, the mountainous coffee region of Colombia, where he learned to play the tiple from his father and brothers. He went on to study with Maestro Benjamin Cardona before entering the conservatory of Universidad Technologica of Pereira. 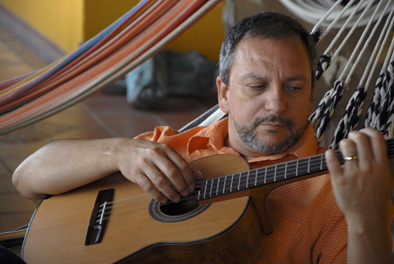 Before moving to Boston, Gallon was very active in Bogata's musical scene, performing and recording with Trio Ancestro, as well as dedicating himself to bringing up the next generation of leading Colombian tiple players. He recently recorded with several Latin American musicians in Boston. He continues a tradition of well known tiple players like Gonzalo Hernandez, Pacho Benavides, and David Puerta. Eduaro Carrizoa, Orquestra Conductor says, "Colombian tiple has in Fabian Gallon its best passionate and knowledgeable interpreter. In his hands lay the responsibility of keeping the path of the development of the technique and interpretation of the instrument." In 2018, Fabian Gallon was awarded a Mass Cultural Council Artist Fellowship in the Traditional Arts.